As you know, I’ve been providing monthly updates from my trading portfolio. My May Update was on 5/16, so returns are based on 5/17-6/7 for a hypothetical even-weighted portfolio of long holdings (* silver lining in my other positions). 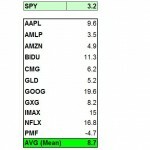 Over the past several months, the Darwin portfolio has outperformed the S&P500, but not so this month. Since 5/17/2010, the S&P500 has declined 7.4%. The Darwin’s Money Portfolio declined 8.6% during that period. 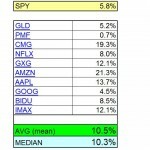 While the long portion of the portfolio lost more than the benchmark S&P500 since last update, I’m still very optimistic about the performance and returns in general since the hedged and short positions are performing in stellar fashion in light of the recent market downturns, not to mention the fact that the portfolio is relatively high Beta, so the expectation would be that it outperforms in up markets and underperforms in down markets. To stay roughly even in such a volatile market is just fine by me. By hedged and short positions, what I’m referring to is positions like the Puts on BP I bought during the month, the pairs trade I captured in gold ETFs to exploit pricing anomalies (I posted strategy at ETFBase [RSS]) and shorting of leveraged ETF pairs to exploit the value decay that occurs over time. To date, I’ve netted over $3600 on this portion of my portfolio. So, while the market has swooned and is well off its highs, my trading portfolio is actually only 0.5% from its all-time high that I hit last week. I view the ability to make money in any market as paramount, and hence, why I have a trading account in addition to my long term 529 Plan , 401K, IRA, etc. which I leave fully invested in index funds at all times. During the month, I made a few trades here and there and unloaded some heavy positions. 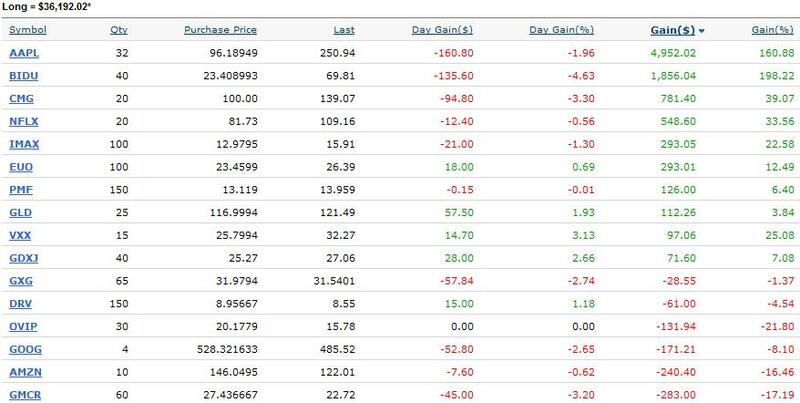 While I’ve been using Ameritrade, there are other great trading outfits; like some with a demo account. 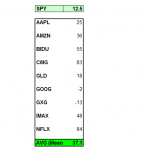 AAPL – For instance, Apple still comprises a substantial portion of holdings and at a 170% return in a year, I didn’t regret selling off some shares earlier in the month at 262. Apple was down just 1% during the period overall. EUO – The Euro is imploding (see laughable Austerity Measures and protests that followed to understand why). While I’m not a fan of being net long leveraged ETFs over extensive periods of time, I viewed this short Euro currency ETF as the best way to exploit this seemingly obvious crash. Up 7% during period. GLD and GDXJ are my two gold plays; however there are many gold investments with varying holdings and tax implications, so read up and determine which one is right for you. 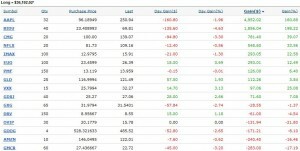 Interestingly, while GLD gained 1%, GDXJ lost 7%, reflecting the divergence between underlying bullion and the operational risk of holding miners. Netflix (NFLX)was up 9% given continued enthusiasm for new ways to provide access to users over the iPad and today, the iPhone. 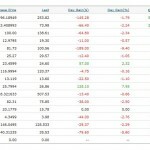 VXX was up 20% during the period, which is my play on volatility. Admittedly, I did unload some VXX during the month as well, but I’m still holding some just in case we see another flash crash where VXX can move 30% in a single day. Nothing else too exciting, but make sure to follow my RSS for next month’s update and Twitter for real-time trades. Portfolio Update – I Tripled the S&P500 – Again! Next post: 10 Ways Spend Less Time at work – Guaranteed!